With the release of latest entry in the 2016 Barrel Society lineup, it was time once again to visit my neighbors at Night Shift Brewing. It took me a few days to get to this one, but fortunately it was still available for tasting by the time I was able to get to the brewery. Description: Described as wheat wine aged in bourbon barrels with “warm flavors of walnut, caramel, black tea and raisin,” it was bottled back in April and released to Barrel Society members on 05/16/2016. My 8 oz. serving was poured from the member’s tapline into a flute glass. Appearance: Medium brown/dark amber body topped off by a healthy two-finger foamy off-white head. Smell: Bourbon barrel and sweetness from dark fruits. Taste: The beer had a moderate sweetness throughout; dark fruits upfront turning to caramel malt and brown sugar for the finish. Balancing out this sweetness were an oaky barrel presence and more subtle hints of vanilla and black tea in the background. There was also a good amount of bourbon towards the end, especially as the beer warmed. For me, this one got better and better with each sip as the longer it sat, the more these other flavors emerged. The alcohol was occasionally noticeable, though never strongly enough to suggest the beer was over 10%. Mouthfeel: Thicker in body, it had a nice smoothness that complimented the various flavors and made the beer very pleasing to drink. Hype Factor: Due to the nature of these releases, I think it is fair to say I go into each one with heightened expectations. I was also excited to see them do a wheat wine for this release considering how infrequently I drink this style and how much I liked Marilyn, their blonde barley wine, back in February. Overall: Very solid offering. It featured an excellent blend of flavors and was very enjoyable and relaxing to sip at. Offering the right amounts of bourbon, sweetness, and supporting flavors I’d call this beer a success and an excellent second entry into this year’s series. Considering that the whoopie pie is official dessert of Maine, it seemed appropriate that one of the state’s breweries would attempt a beer using this treat as an inspiration. In theory, the main components, chocolate cake and a sweet, creamy icing, could work quite nicely in a stout. Let’s see how it turned out. Description: The label described this as a milk stout aged on cacao nibs and vanilla beans. The brewery doesn’t seem to have an official website yet, so that is about all I had to go on here. For my end of things, I poured this into my trusty snifter glass and paid a fairly reasonable $8.49 for the 22 oz. bomber. Appearance: Poured a dark black body with a finger-plus foamy tan head up top. Smell: Sweet malts and a bit of vanilla. An occasional hint of roast every now and then for good measure. Taste: Lots of cacao, bittersweet dark chocolate, and light roast coffee on the front end. There was a nice sweet cream taste that built up towards finish, but ultimately that got offset by an assertive bitter/roasty taste from the cacao nibs and a bit of vanilla lingering in the background. As the beer warmed, the chocolate and sweet cream started to come out more, though never quite overcoming the roasty bitterness that characterized the beer. I felt like this had moments of tasting like a whoopie pie, but could never quite maintain them. Mouthfeel: Fuller bodied with a slick, smooth character. There was some carbonation present, but not much. Hype Factor: Just my own curiosity about both the brewery in general and the beer in particular. Overall: Not bad, but ultimately confusing as the beer didn’t really end up tasting like its namesake. That said, I do think this would have been pretty spot on if they lightened up on the adjuncts a little bit. There was a really nice chocolately milk stout somewhere in there, but the cacao and vanilla took over the beer to the point that it just didn’t resemble what I think they were going for. 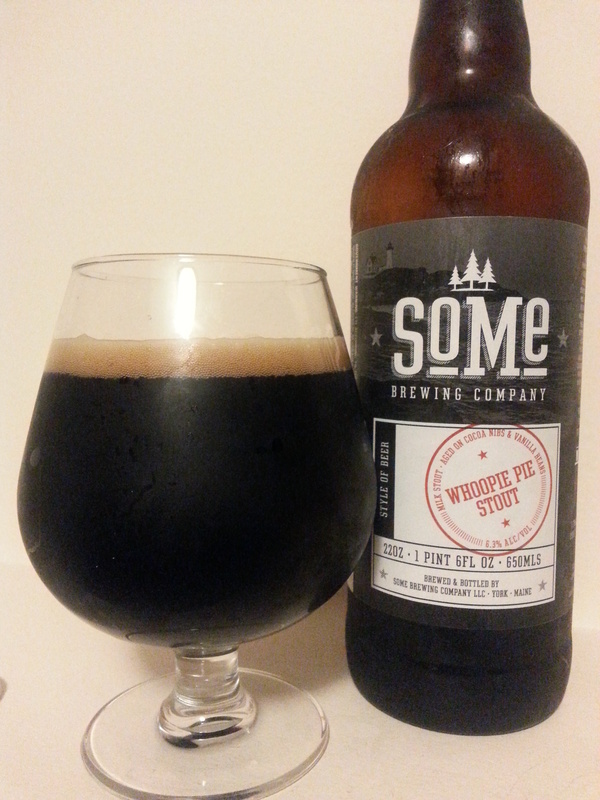 It wasn’t bad necessarily, but I wouldn’t have called it Whoopie Pie Stout. This was another novel I came across while going through a number of “Best of 2015” lists earlier in the year. I was a little wary of this method based on my experience with the last book it lead me to, but the author, Kim Stanley Robinson, has an excellent reputation and this book was near the top of almost every list I came across. Seemed worth a shot. Taking place in 2704, Aurora introduces the reader to 2,100 would-be colonists traveling to a habitable moon 11.9 light years from Earth in the Tau Ceti system. They are 159 years into their 170 year voyage and the descendants of the ship’s original pioneers are making their final preparations to arrive in-system and make planet-fall at their destination. Their story is told from the point of view of the ship’s quantum computer, which has been tasked with expanding upon its original programming by creating a narrative account of the journey. It does this by examining the lives of the passengers aboard the ship through the life of a girl named Freya, the daughter of the ship’s de-facto leader and chief engineer. It is through this narrative of Freya’s life, that we are given an in-depth analysis of the trials and tribulations faced by the colonists as they attempt to arrive at and settle the new world. As part of the story, the book covered a wide variety of theories and concepts within the realm of the natural sciences. The author in particular spent a lot of time examining the technological, biological, and ecological concerns facing the colonists on every step of their journey. What I particularly appreciated about these aspects was that they were brought up in a way that was approachable for someone like me who finds these ideas fascinating but isn’t necessarily coming at them with a degree in the field. I was particularly interested in the author’s musings on the Turing Test and the Fermi Paradox, though I was also inspired to read up on things like prions and LaGrangian Points as well. There was also a compelling human element as many social, psychological, and political issues were raised alongside the more technical ideas mentioned above. Via the computer’s narration, the author did an excellent job creating a diverse and dynamic group of characters facing a variety of personal and societal challenges as their journey goes on. I found myself actively taking sides in some of the conflicts that developed and feeling emotionally invested in how they were resolved. The main action sequence towards the end of the book I found particularly exhilarating and couldn’t bring myself to put the book down until I found out what happened to the crew. While on the whole I found this story quite engaging, there were two areas in which I felt like it stumbled a little bit. The first of these was that there were a few places in which the text got a bit too long-winded or overly verbose, usually on account of a drawn out explanation or some deep introspection on the part of the computer. This was done intentionally (and explicitly acknowledged) to good effect in some sections, but at other times it was just a drag on the action. Secondly, there was an idea raised and mentioned sporadically throughout the story (I won’t give it away to any potential reader) that seemed to have promise, but ultimately never went anywhere. Those points aside, what I liked about this book far out-weighed these momentary frustrations. Although it did take me a few pages to really get into the story, once I did I was hooked and found this to be an immensely enjoyable and satisfying read that somewhat unexpectedly ended up being equal parts exhilarating, informative, and thought-provoking. This was a bit heavier on the science than the other books I’ve posted about lately, but don’t let that get in the way of picking it up. I am really happy I did, and if I get nothing else out of going through all those book lists, this one made the effort worth it. I liked the random alien references on the can, but something about the two “Does Not Contain Juice” disclaimers stuck me as odd. Not sure if this was part of the joke or a required disclaimer, but I found it weird, especially in this area of juicy DIPAs. Either way, I’m getting side-tracked. On with the review. Description: As detailed on the brewery’s website, this was brewed with two-row and caramel malts and a heavy dose of Galaxy, Mosaic, Citra, Columbus, and Ella hops. No date on the can that I could find, but they do say that the last canning run was on 04/22/2016 and these weren’t at the store a week or two ago. The $15.49 price tag for a four pack of 16 oz. cans seemed a bit high for what I was used to from this brewery, but I went with it based on their track record. 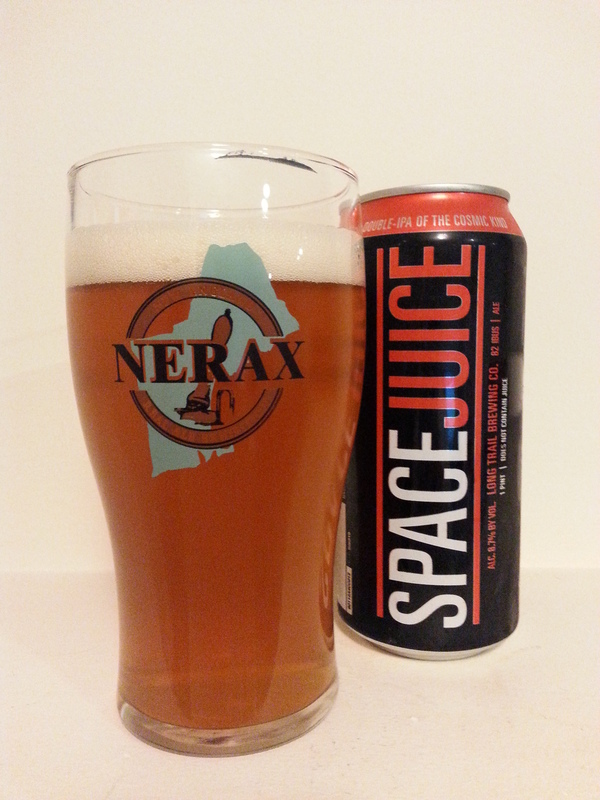 I poured the beer for this review into my NERAX pint glass. Appearance: Poured a not quite opaque light amber body with a foamy white head. Smell: There was a bit of sweetness, but overall not much to say here. Taste: Sweet malts upfront with a piney, earthy bitterness on the back-end. Not very assertive on either front, I would call both tastes more muted than I would balanced, though they were certainly the latter as well. The finish had a hint of alcohol, especially as the beer sat for a bit, and had a lingering sugary sweet taste mixed with some bitterness. Mouthfeel: Medium-plus bodied with a slight creaminess. Moderate amount of carbonation. Hype Factor: I had seen online that some people looking forward to this one, but that’s about as much hype as I am aware of. Overall: This wasn’t necessarily a bad beer, but I did find it disappointing. It didn’t quite do it for me stylistically and at the price point it was offered at I have come to expect more. The beer ended up coming off as more muted than balanced, which led me to wonder about freshness. However, since the website states that this was scheduled to hit stores in early May (right around the time I drank it) I have to assume that this is representative of what the beer was meant to be. I’ll have no problems finishing the rest, but is not something I would seek out again. At work last Friday we continued our semi-official office tradition of picking up a few growlers at Trillium Brewing Company to help close out the week. We went with an old favorite, their Galaxy Dry-Hopped Fort Point Pale Ale, and a little something new to try out alongside it. Here’s a look at that something new. Description: The first installment in Trillium’s new Permutation line of draft-only brews, this was presented as a sessionable pale ale featuring the up and coming Idaho 7 hop. Some more information about the beer and recipe specs can be found on their website here. I poured this round from a growler acquired earlier in the day into one of the office pint glasses. Appearance: The body was pale straw yellow that had the brewery’s distinctive cloudy haze. Topping it off was a fluffy white head that stuck around through most of the drinking experience. Smell: Earthy hops with a hint of lemon zest. Taste: Started out with a light bit of earthy and floral hop bitterness, accompanied by light malts and notes of orange and lemon zest. It had a grainy, earthy finish that served to blend together the different tastes really well into one refreshing whole. Mouthfeel: Medium bodied and on the lighter side with the carbonation. Very smooth and really easy to drink. Hype Factor: There’s always a certain amount of excitement around a new Trillium beer, especially one that is part of an experimental series. The Idaho 7 hop variety has been showing up a lot in these parts lately, and I was very curious to see what Trillium could do with it. Overall: This was a hit among the Friday beer crew at work. Refreshing and flavorful, it was the perfect beer for the end of a long work day that also happened to be one of the warmest days of the year so far. This would be a great beer to drink outside. I’ve had a pretty busy schedule lately, but I managed to find some time last night to sit down and enjoy a nice beverage. Brewed by Carton Brewing Company from Atlantic Highlands, NJ, this was another highly appreciated gift beer leftover from last weekend’s festivities. Description: Part of the brewery’s 077XX series of experimental DIPAs, this installment took the base recipe and dry hopped it with Sorachi Ace. For a bit more information on this fun concept, you can see a quick video wherein the brewer describes the series here on their website. For a change of pace, I drank this from a pint glass I picked up at the NERAX festival last month. Appearance: A hazy light orangish/amber body, topped by a foamy white head. Smell: Light tropical fruits underneath a heavy layer of zesty bitterness. Taste: Started out following the smell, but ended up taking a few interesting turns. Tropical fruits were present from the start and lingered right on through to the end. Towards the middle the beer also took on a lemon zest flavor, accompanied by an aggressive spicy and resinous hop bitterness. Underneath all this was a yeasty taste that added another sweet and somewhat tangy dimension to the beer. Really an interesting blend of sweetness and bitterness that I can’t say I’ve come across very often. The finish was dry and left a slight numbness on the tongue due to the bitterness from the hops and lemon zest. Very interesting. 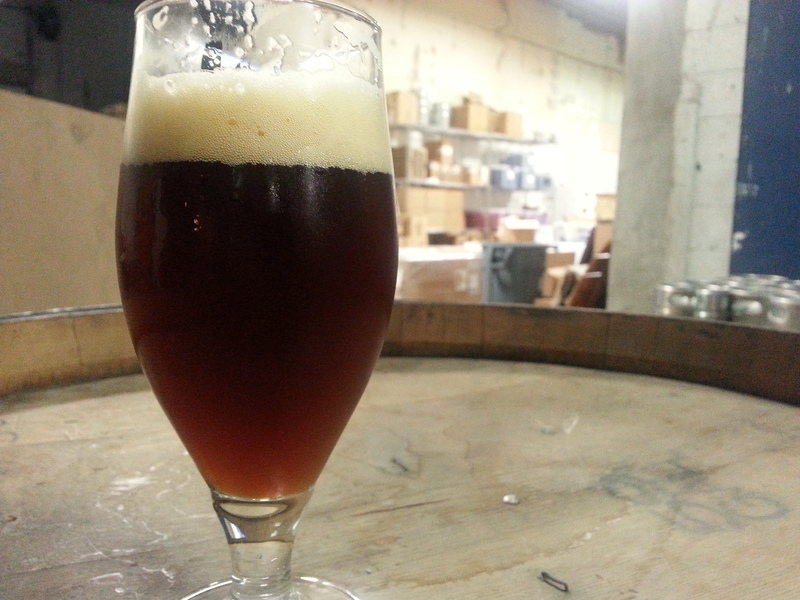 Mouthfeel: The mouthfeel was pretty typical for the style, medium bodied with a moderate amount of carbonation. 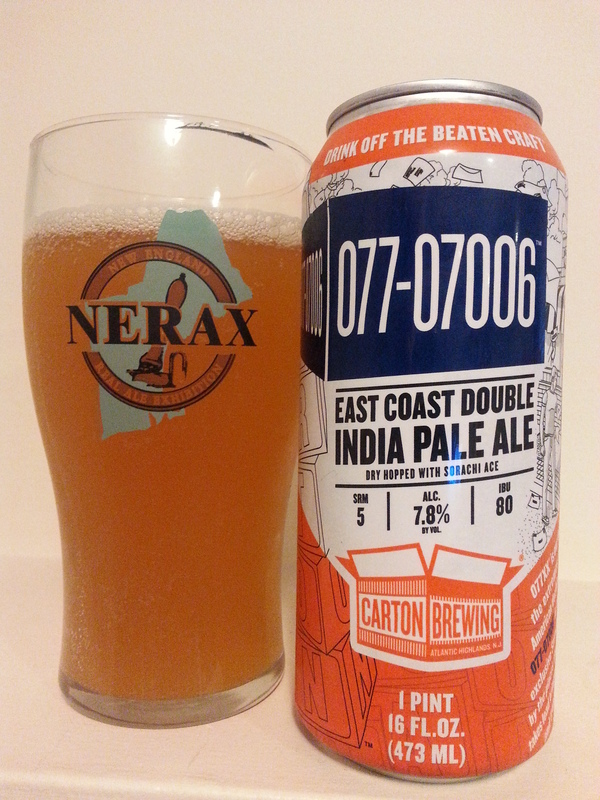 Hype Factor: I’ve heard a lot about Carton, but until this beer the only other offering from them I’ve had a chance to try was their Boat Beer. I was pretty curious to see what this one was all about and considering where it came from, I was pretty confident that it would not disappoint. Overall: After taking a few sips to really contemplate all aspects of the taste, I found that I really liked this beer and its complexity. There was a lot of fruit sweetness and hoppy bitterness for sure, but all of it was rather distinct and served to easily distinguish this beer from any of the other DIPAs I’ve tried lately. It kept me guessing and I really enjoyed that. Sure did make me curious about the rest of the series as well. I always enjoy getting a chance to try beer from a brewery outside the areas I typically travel. This can from Tired Hands Brewing Company in Ardmore, PA came to me via friends visiting from New Jersey last weekend. Description: Per the label and description on the website, this was brewed with rye, wildflower honey, and the juices and zest from lime, lemon, grapefruit, and blood oranges. For the hops they used Citra, Mosaic, and Simcoe. Per my usual, I poured from the cold 16 oz. can into my snifter glass. Appearance: The body was opaque and had a hazy pale straw color. 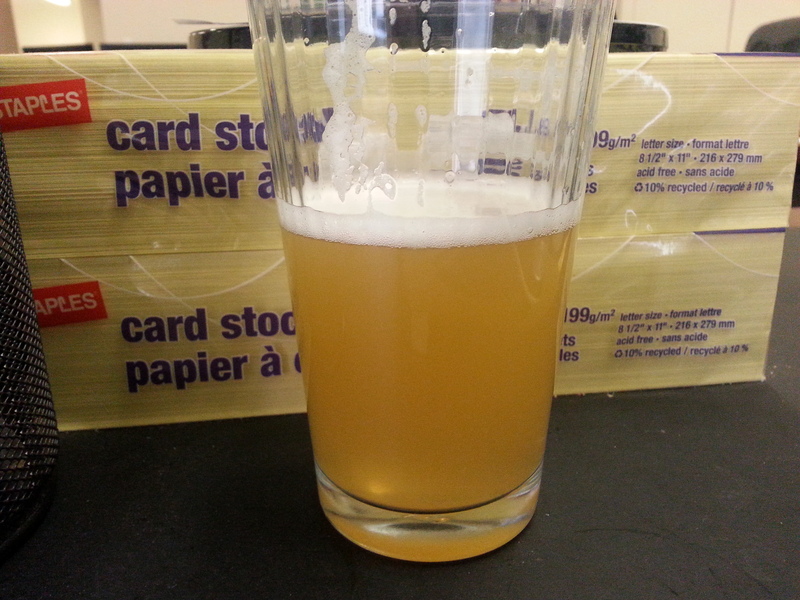 A thin, fizzy white head formed during the pour but quickly dissipated. Smell: A variety of sweet citrus fruits atop a mostly piney bitterness. Taste: Juicy! Sweet mango/tangerine/orange tastes up front. The sweeter fruits transitioned to a more bitter and zesty lime and grapefruit finish accompanied by a light piney bitterness. When left to sit a few minutes, the honey and rye became a bit more noticeable and blended in with the initial sweetness. Very flavorful. Mouthfeel: Medium-plus body with a juice-like consistency. Moderate carbonation came in just after the initial sip. Really easy to drink. Hype Factor: I was excited to finally get an opportunity to try something from this brewery. I have seen them pop up many times in my Untappd feed and have heard plenty of good things about them. Overall: An excellent beer, roughly on par with what I might expect to pick up from Trillium (though without as much bitterness). Tired Hands impressed me with this one and I would definitely welcome any chance to try them out again in the future.